"...if you have hopes of finding an uproarious light comedy, you've been misled." The Masked Reviewer just sat down to begin his review of this film when suddenly he realized just how clever the title is! See, the family that this movie is about is named Stone. They're the Stone Family. But, one of the major plot points revolves around a family heirloom that is a diamond ring. That's also the family stone! Get it? It's so clever! Stone Family would have been a better title though. Stoned Family would have been a much better title, but a very different movie, too. Although, that wouldn't necessarily have been a bad thing. Here's the deal. *sigh*. There's this trend -- it's been around for a while, but seems to be getting worse lately -- where studios will take a finished film and put together the trailers, previews, and ads. And the way they cut the trailers, it looks like the movie is something that it's not. This is a Bad Idea. It's great if the studio thinks they've got a bomb and they want to trick as many people to go on opening day as they can, but in the long term, they have to know that people are going to tell their friends "this isn't what I expected!" Usually, when you get something you didn't expect, it's more often a Bad Thing than a Good Thing. People say "this isn't what I expected..." when they get socks for their birthday instead of Knicks tickets. People say "this isn't what I expected" when they bite into a chocolate that they expect will be filled with creamy nougat and instead they get pureed asparagus. The Family Stone is being pushed as a funny holiday comedy. The clips feature slapstick, laughing, chasing, joking, and goofiness. The music is light and upbeat. So, it's a funny holiday comedy, right? Yes! It is! Oh wait, no, it isn't. The Masked Reviewer figured you were probably expecting to hear that it wasn't, so the Masked Reviewer thought he'd throw you, the reader, a little curveball. Pretty upsetting, isn't it? The Family Stone (formerly called The Family Jewels) isn't much of a comedy at all. It's probably best classified as a "dramedy", but better described as a wannabe touching family movie. It talks to the heart, people! But what it says is "get me out of here." Okay, it's not that bad. It does have some amusing moments, and, if unlike the Masked Reviewer, you have a heart, you might find some of the moments to be touching. But it swings back and forth, and you're never sure how you should feel about things. Diane Keaton plays the family matron. Craig T. Nelson plays the family patron. A giant robot with a sword plays the family Voltron. Ha! Just kidding. The family is rounded out by the kids, including Dermot Mulroney, Luke Wilson, and Rachel McAdams. Demot Mulroney brings his girlfriend, played by Sarah Jessica Parker, home for the holidays to meet the family. The ads make this seem like Meet the Parents, but it isn't. There's a lot of tension and hostility and weirdness. The family is portrayed as utopian at first...all love and perfection and sunshine and lollipops. As things progress, we see their less-than-pleasant side, but it's hard to know what the filmmakers want you to feel. Are we supposed to like Sarah Jessica Parker, or hate her? Is the mom the good guy or is the son the good guy? And then, things get all confusing when...well...a lot of stuff happens that Christmas Eve. The events seem totally implausible and random and the resolution is not believable. In a goofy comedy, you can forgive that, but when the film is held together by the heavy heart-touching sob-stuff, it just seems random and odd. It's too bad. The performances are fine across the board. Sure, Sarah Jessica Parker plays it up too much...she seemed to be convinced she was in a screwball comedy and overplayed things. But no one else was on the same page as her. Tender moments seem wasted. Diane Keaton is interesting, but...oh, it's all so convoluted. This movie wasn't ready to be shown. It's not awful, it's just...not ready. What is it? Nobody knows. One might almost think that someone started to make a comedy, then someone else took over to make it a tear-jerker. The end result is...a comi-jerker. And there's good reason why you've never heard of such a thing. Again, it's not the acting. And there are some funny parts. But not only is this not a comedy, it's not anything. Any goodness comes from the actors themselves, but it just goes to show you that putting a bunch of actors on screen doesn't mean you instantly get a great movie. You need writing and direction, and this movie lacks direction. The director, Thomas Bezucha, also directed Big Eden, which you probably haven't heard of (no offense, Mr. and Mrs. Bezucha). There's probably a reason why you never heard of it, too. 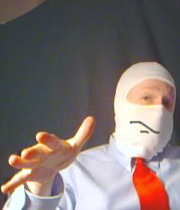 The Masked Reviewer recommends that you might want to hold off on seeing this right away. Some people will like it, especially fans of the stars. But if you have hopes of finding an uproarious light comedy, you've been misled. It will probably do big numbers on opening weekend, because a lot of people are expecting something that this film is not. Don't be fooled. And by the way...Diane Keaton is believable as the mother of Luke Wilson, Rachel McAdams, and the other girl...but as Dermot Mulroney's mother? He looks older than she does! Sure, she's actually 17 years older than him, which is technically old enough to really be his mother, but the family members aren't terribly convincing as a family. And Sarah Jessica Parker looks like she could be the family grandmother. Oh! That's cruel. Sarah Jessica Parker fans, don't hate the Masked Reviewer! But you've got to admit, she's getting a little long in the tooth to be playing the young-and-perky types anymore. Expectation from the Title: When Bob's Pet Rock goes on a quest to find his birth-parents, he begins a journey that will take him to the center of the Earth...and to the center of his soul. Mother's Rule (Always Say Something Good About Everything): Diane Keaton always looks fabulous. The Pros: Charismatic cast that aren't bad...aren't bad at all. A couple of good laughs. The Cons: Biggest drawback...this is not what you expect. It's not a comedy. It's not anything. Needs better direction and editing. Unconvincing ending...nothing flows right in this film.